Love Ice Skating is a family run business. We began in 2010 after a fruitless search for quality skate wear here in the UK for our daughter. Frustrated by the lack of choice we began importing directly from the USA, Canada and Europe. The business grew quickly and we decided a website was in order. Our ethos was simple, if it wasn’t good enough for our daughter and her friends, we wouldn’t stock it. Our dream was to have a shop eventually, somewhere skaters could visit and actually try on clothing and Skates. Our vision became reality in 2013 when our boutique opened. We call it a boutique as it is unlike any other skate shop we have been in. Chandeliers, damask seating & huge ornate mirrors make Love Ice Skating very different, very unique. With a second shop right next door, we could open our boot and blade department. Now, our dedicated team of staff are on hand to help with online questions and orders and also ready and willing to help customers in our boutique. We understand that skaters come in all ages, sizes and abilities and are proud to include past and current British champions, new skaters starting out on their Skate UK adventure and toddlers through to adult skaters amongst our happy customers. Why Choose Love Ice Skating? Put simply…because we “Love Ice Skating”! Every member of staff skates. We have all been through the grades and beyond and know how important selecting the correct boots is, how exciting it is to buy your first outfit and how nervous skaters can get leading up to a test or competition. All of our staff are competitive skaters, some at very high level. 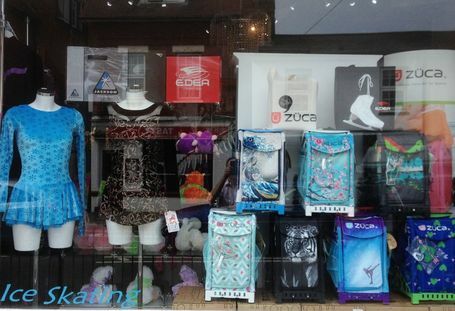 We stock an extremely wide range of clothing and accessories in all sizes. We can offer advice and help with sizing, colours or gift ideas. Our aim is to make every customer feel special, because they are. In our boutique we will ensure you have the perfect boots for you, we can custom heat mould & sharpen blades and will size, cut & fit new guards to your new skates at no charge. We can mount blades for you too. Spend as long as you wish trying on your chosen skate wear, fill out a birthday or Christmas wish list or relax in our seating area whilst your skater does! Our online customers receive regular newsletters so they don’t miss out on new arrivals and clothing orders are wrapped in our signature tissue. We continually strive to offer you the best possible products and service, all with a personal touch.